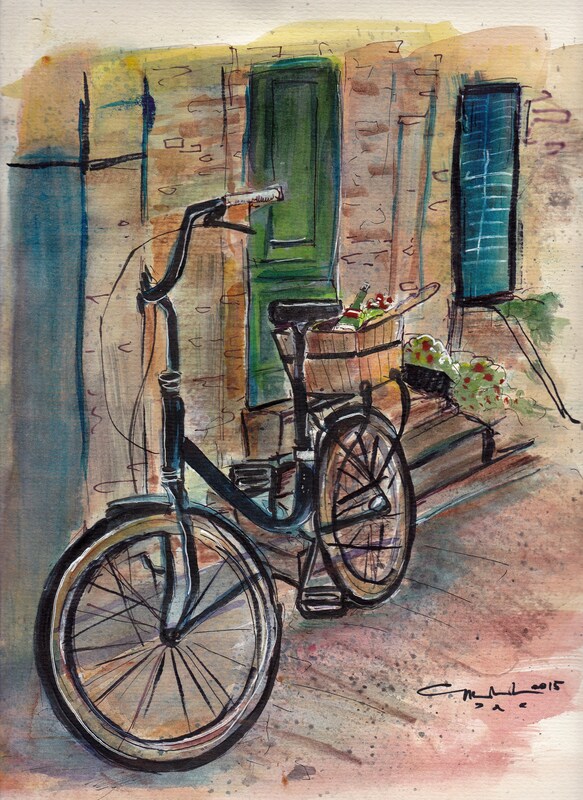 I have always loved the style of urban sketchers. They draw as much as they can on a subject on a limited time. The subject is anything they can draw and anything they want on location to capture the time and place they are in . They do it on journals with watercolor, ink, colored pencils and crayons and the emotion, speed and spontaneity of the style attracts me. It seems fit for a girl like me who is always on the move, always on the go. You can check out http://www.urbansketchers.org/ for samples of the artform. wish i can do it, but all I can do is emulate the style in the piece on the left. I was trying to capture a street scene in Italy as fast as I can on a Berkley WC paper, Hotpress. I find that Hotpress paper is best for this because it dries fast and pigments seem to be more vibrant on it. It takes only a little to do a lot. I first did a sketch thumnail to plan the design (what? Maria is planning a sketch?) and then i dove into drawing. The most complicated are the shadows under the bke and behind the wheels. I just cant seem to get it right. But I really had fun doing this and I think, it does tell a story don’t you think? I am obsessing over bike pictures so expect more bikes in the near future.